'Color Binoculars' is an free app that enhances the real world for anyone with color blindness. Color Binoculars landed on the App Store today, promising to infuse the real world with color for anyone with the three most common forms of color blindness. This isn't the first app designed to help color-blind folks see a broader spectrum of colors, but it comes from two Microsoft software engineers (one of whom is color blind), and its straightforward filter method is simple to use. The app uses the iPhone camera to adjust colors in a way that makes them easier to distinguish for color-blind people. The enhanced image shows up on the iPhone screen, allowing users to pick out flowers, choose matching outfits or take in the beauty of fall, for example. 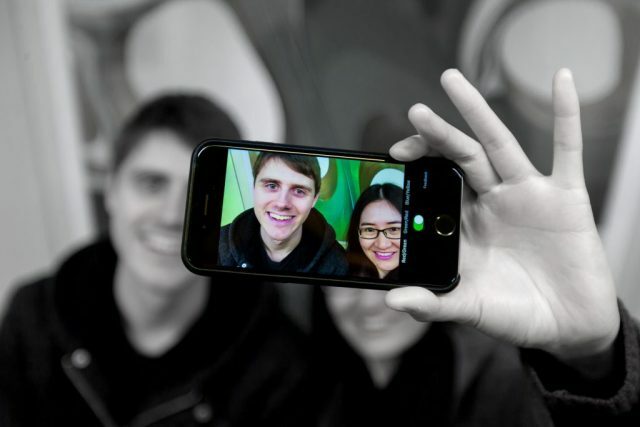 Tom Overton and Tingting Zhu started working on Color Binoculars during Microsoft's 2015 Hackathon and they finished it in the company's Garage program, which helps experimental apps go public. Overton is color blind, so he was both a developer and the app's main tester. "It's an app that helps color blind people distinguish color combinations that they would normally have trouble telling apart," Overton tells the Microsoft blog. "For example, since I have difficulty distinguishing between red and green, our app makes reds brighter and greens darker so that the difference is more obvious. It replaces difficult color combinations, like red and green, with more easily distinguishable combinations, like pink and green."